Because many traders lack the knowledge and skills to read the market correctly and the necessary discipline to avoid being distracted by irrelevant "market static", authors James and Robert Dalton and Eric Jones have developed an innovative solution to this problem. In their new book, Mind Over Markets, the authors present a fresh new approach to trading futures. Their suggested approach is elegantly simple -- showing in five basic steps how traders and investors can quickly learn the insights, nuances, subtleties and signals of the market. 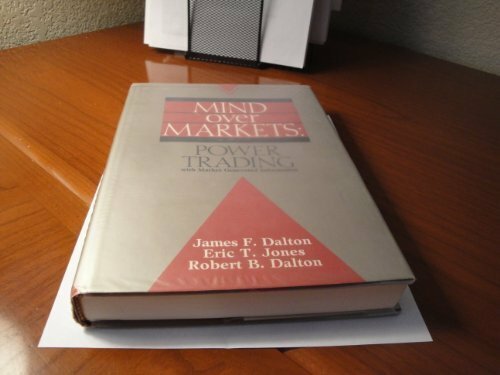 What readers of this book can pick up in 275 pages normally would take other traders years of painful experience to learn. The Mind Over Markets approach succeeds because it shows how to listen to the market and base their trading decisions on current market information and not on uninformed guesses and hunches, on antiquated trading systems and techniques or on the analysis of outdated past performance all of which are used by most other traders. Among the many topics covered are: introduction to day timeframe structure; market structure, logic and time; trending and bracketed markets; day timeframe trading and pattern recognition; long-term trading; markets to avoid; a business-like approach to trading, including tips on capital requirements, developing good timing skills, gaining knowledge about the competition, understanding risk and setting goals. This title is a co-publication with Probus. If you have any questions about this product by Probus Publishing Co., contact us by completing and submitting the form below. If you are looking for a specif part number, please include it with your message.